The UN General Assembly is convening from September 18 to October 5 at UN headquarters in New York. The world's biggest gathering of powers-that-be has offered a fair number of big speeches and big conversations - as well as big brawls and big gaffes. Sputnik offers you the opportunity to take a look at the most memorable of them so far. Donald Trump was forced to pause his General Assembly speech when it was interrupted by laughter from the audience right after he bragged that he had "accomplished more than almost any administration in the history of our country." The US President apparently didn't quite grasp what the audience was actually laughing about; speculations have also sparked on social media that the world's representatives were laughing not "with" but "at him." POTUS received his portion of sarcasm on social media in a separate episode, this time together with Ukrainian President Poroshenko. The two attended the UN gathering in outfits that were alike in every detail, including red ties. Svyatoslav Tsegolko, spokesman for President Poroshenko, even posted a photo of the two presidents with their wives, captioned, "When even the dress code symbolizes the unity of the strategic partners' positions." It is yet unclear whether Poroshenko wore Trump's landmark red tie intentionally, but the tweet has triggered a barrage of jokes from Twitter users, with some suggesting that the Ukrainian President wore the same underwear as Trump. Poroshenko delivered a stinging rebuke to a Russian journo when approached for comment on an agreement on a peacekeeping mission in Donbass. "No interview for Russian TV," he said, "because you are fake news and are spreading disinformation." But there was more to come: according to the Russian daily Kommersant, Poroshenko walked through the wrong door and arrived in the Russian delegation's meeting room. He reportedly spent around 15 seconds there and then headed for the General Assembly Hall. "[He] probably confused [the room] with the toilet," joked Russian Foreign Minister Lavrov, who heads his country's delegation at the summit. Ukrainian representatives stole the show once again: Alexander Molokhov, the head of the working group on legal issues under the Crimean government, said that he had an altercation with a member of the Ukrainian delegation after he delivered a report on Crimea-related sanctions introduced by Ukraine, the United States, and the EU. Another human rights advocate, Ukrainian billionaire Sergey Pinchuk, talked about the pressure that Crimean Tatars face in Ukraine. According to Molokhov, the Ukrainian delegation didn't have any objections during his speech; however, after the session, an unnamed Ukrainian official waited until the activists walked out of the conference hall to threaten Pinchuk and give him the finger. Moroccan Prime Minister Saadeddine Othmani bemoaned on Twitter that a Kosovan diplomat had "imposed his presence" during this week's United Nations summit. The PM went on to reaffirm that his country didn't recognize the unilaterally proclaimed independence of Kosovo from Serbia. During a breake with my délégation a gentleman from Kosovo imposed his presence. — EL OTMANI Saad dine (@Elotmanisaad) 25 сентября 2018 г. Although Othmani didn't identify the man he had met, his comment came after Kosovan Foreign Affairs Minister Behgjet Pacolli tweeted a photo of himself having a "fruitful discussion" with Moroccans on the sidelines of the summit. — Behgjet Pacolli (@pacollibehgjet) 25 сентября 2018 г. New Zealand Prime Minister Jacinda Ardern has brought her newborn daughter to the UN General Assembly Hall, much to the pleasure of all loving parents across the globe. — SBS News (@SBSNews) 25 сентября 2018 г. The UN gave the three-month-old Neve Te Aroha a mock security pass, which lists her as the "First Baby" of New Zealand. French President Emanuel Macron has spoken for three times as long as the UN's advised 15 minute speech limit. 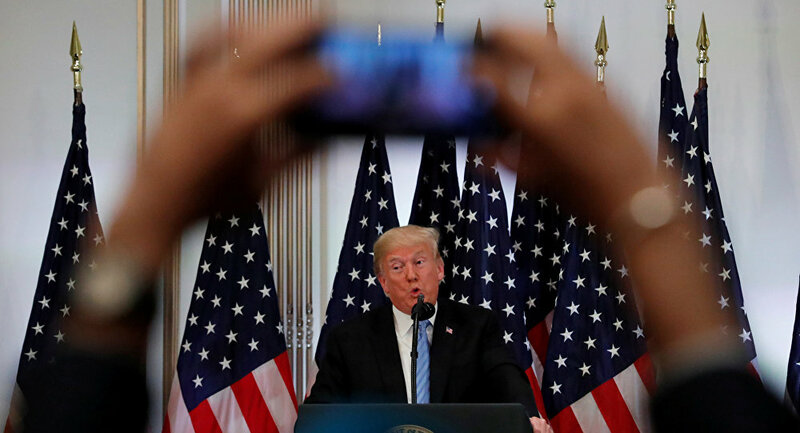 By the end of his expressive speech, dedicated to multiculturalism and to what he called the inevitable defeat of nationalism, the president got all steamed up and accompanied his words with dynamic hand gestures. "All of this happens because we turn our heads and remain complacent," Macron said in a raised voice, repeatedly slapping his hand onto the podium.